As we discussed in previous posts, VeriShow and LivePerson have been working together this year to optimize customers’ multimedia online sales and support. The integration couples our multimedia platform, which delivers live help and real-time sales support to website visitors, with LivePerson, enabling customers to prioritize and provide high-touch customer service with multimedia engagement. VeriShow lets agents take their interactions from live chat to being able to share and annotate images, files and videos. 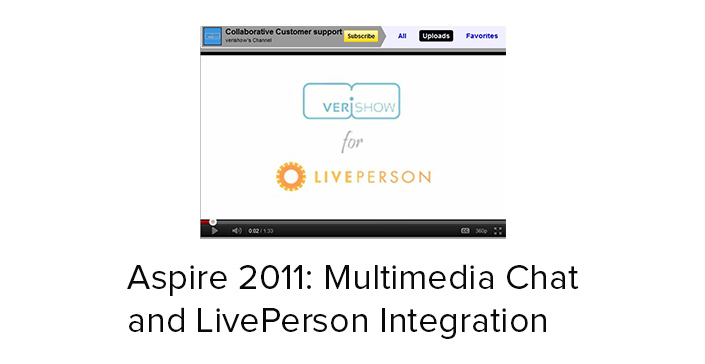 On Monday, October 24, we will be attending LivePerson’s community event,Aspire 2011, in New York City. With more than 8,500 attendees, we look forward to working directly with LivePerson’s client base – experts in customer engagement, personalization and customer intelligence across every industry. We’ll be chatting about the latest and greatest in customer engagement, and specifically trends and technologies that promote increased sales and ROI. At the show we will highlight our latest integration updates include co-browsing and video communication capabilities. These are critical updates to the integrated solution, allowing customer service representatives to get more involved in the shopping and purchasing of their web site visitors. Make sure to stop by our booth number 18.